Espoma 50 lbs. Organic Holly Tone Evergreen & Azalea Food by Espoma at Heirloom Gardens. MPN: 184270. Hurry! Limited time offer. Offer valid only while supplies last. Help your flowers bloom better and promote healthy growth in your organic garden with the Espoma 50 lbs. 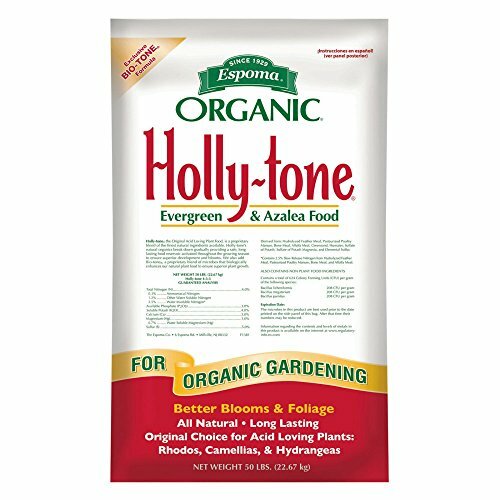 Organic Holly Tone Evergreen & Azalea Food. Help your flowers bloom better and promote healthy growth in your organic garden with the Espoma 50 lbs. Organic Holly Tone Evergreen & Azalea Food. This long-lasting plant food is rich in vitamins and offers a slow-release formula that prevents burn and leaching. This plant food makes a great choice for evergreens, azaleas, rhododendron, and more. Dimensions: 4L x 15W x 29.5H in.. Designed for organic gardening. Works great on acid loving plants. Long lasting, slow release formula. Proven to not burn or leach away. Capacity of 50 lbs..